Everybody’s all excited about the Internet of Things (IoT). This is no surprise considering that by 2020 there will be 50 to 100 billion electronically connected devices globally with one goal: Connecting people. IoT is more than linking devices together across technological and geographical borders. IoT is about creating an ecosystem to connect people with each other and their environment. An ecosystem where things are becoming smart because of the way human beings are connected with them. msg is a leader in the realm of IoT and digitalization. We are helping organizations create IoT ecosystems leveraging sensors, controllers and big data to provide a “smart world” for their customers in all situations of their lives. Over the past years, we invested heavily in the development of IoT platform solutions. Always focusing on the customer and their needs. 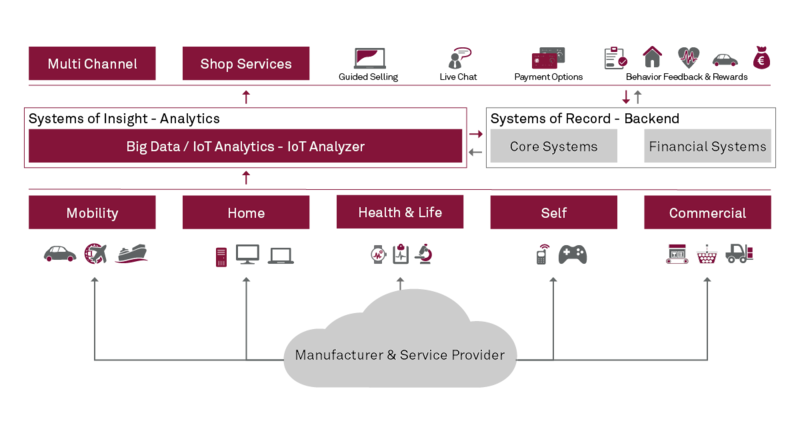 Recently we launched IoT Analyzer (IoTA), enabling organizations to manage, enrich, analyze, model and report IoT data from all different kind of sensors. With increased analytic capability and access to device-collected data, IoTA helps insurers improve risk management and scoring. Data from IoT devices can be shared with policyholders to create products that meet their needs, motivate behaviors that result in lower rates, inform loyalty programs, and inspire loyalty to their brands. The insurance industry is increasingly leveraging loyalty and reward programs to nudge policyholders to a low-risk behavior using IoT technologies such as wearables, smart home or telematics solutions. Our latest IoT product, “Insurance Loyalty & Reward Accelerator,” allows insurers to design and offer their own loyalty and reward programs to their customers, combining latest IoT sensor technologies with traditional insurance products. The solutions run completely in the cloud, which makes them lean, fast and easy to implement. Cookhouse Lab is a collaborative space for innovative thinkers. We welcome insurance and reinsurance experts, financial services professionals, entrepreneurs and academics from around the globe to join in on developing solutions for the current and future trends of InsurTech.